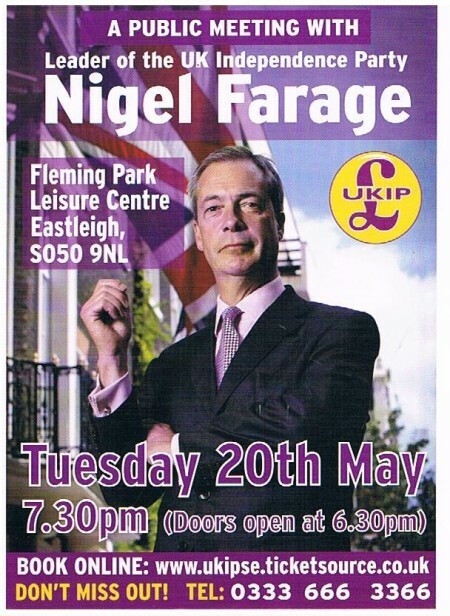 Ukip leader Nigel Farage will be speaking at a public meeting at Fleming Park in Eastleigh on Tuesday May 20 – just two days before the country goes to the polls in the European and local elections. Farage is currently one of Eastleigh’s regional MEP’s and the meeting is to rally support for both Farage who tops Ukip’s list of Euro candidates and Diane James who stood for Ukip in last year’s by-election and is the number three candidate. Farage has been on a nationwide city tour to bolster support for Ukip candidates standing in the May elections and Ukip’s decision to include the Borough of Eastleigh on the itinerary, so close to polling day, is measure of how important the town is in Ukip’s future electoral plans. Ukip are currently expected to win the most seats in the European parliament as they now leading in the European opinion polls with 31% – six points ahead of Labour. How this will translate in terms of local votes is uncertain although a Survation poll last month put the Liberal Democrats in a commanding 12 point lead (39%) over Ukip (27%) in Eastleigh’s local elections. Ukip are standing in all of the 15 Eastleigh Borough Council seats which are being contested – that is a third of the chamber currently dominated by the Liberal Democrats who have all but five of the 44 seats. But it is the forthcoming 2015 general election that will be exercising Ukip minds most. In 2013 Diane James came a close a second and last month and poll by Survation of voter intentions put Ukip support in Eastleigh on 32% – three points clear of the conservatives. Although that’s the first time Ukip has topped any poll for a UK parliamentary seat, the results went largely unreported in the mainstream media but were not unnoticed by Ukip. It is no secret that this highly marginal constituently is a top Ukip target and an insider has told Eastleigh News that the party is prepared to commit the same level of resources as they did in the by-election. Diane James has kept a high profile in the constituency recently and is certainly a strong contender to represent Ukip again in 2015 but when Eastleigh News asked her recently if she would be standing she would neither confirm or deny it. Nigel Farage has stood in Eastleigh before, he first stood in parliamentary election here in 1994. I will make my mind up after May 22. Farage regards Eastleigh as home territory. That Ukip is able to contemplate hiring a venue the size of Fleming Park is a measure of how far and how fast the party has grown recently. 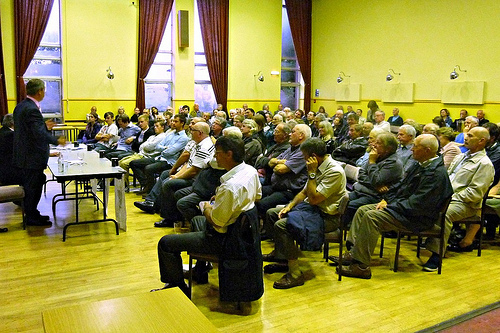 The last time Farage took part in a public meeting here was in July 2012. Around 80 people were at the Railway Institute and Eastleigh News was the only local media present, Farage was able to step outside for a crafty drag unmolested. Two weeks ago at Portsmouth 650 people turned up to be greeted by a crowd of 50 protestors outside along with four police vans. In July 2012 Ukip support was at 5% today it is 15%. The rapid increase is largely due to policy changes in January 2013 when Ukip decided they would highlight the issue of immigration in view of the impending relaxation of border controls for Romanian and Bulgarian migrants in January 2014. Subsequently immigration was a major campaign issue during the Eastleigh by-election, hitting a nerve with the public, and Diane James secured a remarkable 24% swing to finish second having started fourth with the bookies. If as predicted, Ukip will sweep the board at the Euros can they maintain the momentum to clinch seats in Westminster next year? At the moment pollsters suggest no. Voters have traditionally seen Ukip as just a Euro protest party but Ukip say a strong Euro and local performance will be a game changer for them. Certainly Ukip have never previously stood so high in the polls and the latest Guardian/ICM poll has Nigel Farage’s personal approval rating with voters higher than that of Ed Milliband or Nick Clegg. A word of caution though, before you run off to Ladbrokes. In 1998 Australia’s One Nation party – a nationalist anti-immigration party led by the charismatic Pauline Hanson was polling 23% but despite popular support a parliamentary breakthrough never materialised and they only managed to get one Senator elected. Support for One Nation then ebbed away and today the party polls less than 1%. Of course this is not Australia, but Farage and Ukip know parliamentary success in 2015 is vital and he will choose his seat with care. He said recently he would stand down as leader if Ukip failed to win any seats and in that scenario could Ukip survive without their household name leader? (Incidentally Diane James has already ruled out a leadership bid). If Farage chooses Eastleigh for 2015 – but fails to dislodge the sitting Lib Dem Mike Thornton and Ukip fails to return any MPs, then a political career that started here in Eastleigh in 1983 might also end here. In any case, whatever the result for Ukip and regardless of whether it is James or Farage that stands in Eastleigh the constituency is likely to be firmly in the national media spotlight once again next May. The May 20 meeting is described as open to the public “all welcome” but is ticket only (£5). I’m not sure how I feel about charging for a public meeting? Of course it also means that all attendees will be registered some where? I’m feeling uneasy re the precedence this may set? There are privacy issues etc. What do others feel? There was no charge at Portsmouth but entry by pre booked ticket only. No photography or recording was allowed and people were body searched ( a pat down) on way in and bags searched. There have been security issues on this tour so I guess they are taking no chances – those attending Fleming Park are also being asked to bring ID. I remember when Ukip was signed up to NO2ID ! I wonder if this means they have changed their policy on ID cards? Disturbing? I wonder what security issues they’ve had? I’m not liking the “feel” of this at all. Don’t go then, Sue. Simple as that. No I wont book a ticket to go. I did go to the meeting during the by election and heard all the candidates answer questions etc. I may have gone to this one had it been an open meeting. Well there has been at least one egging and there was an incident at Sunderland when two lads filmed themselves singing “F*** off back to Toad Hall, Na Na Na” repeatedly at Farage then posted it on Facebook and I think that’s what they are trying to avoid! Sue, I wouldn’t worry too much – it’s just another way of raising some funds. I was at the Portsmouth rally & it was superb. There must be many new members just from that meeting. Only one protester inside……someone with a duck whistle said UKIP are kwakers! We must show support & definitely not let the ‘left’ intimidate us! Don’t forget to vote UKIP on May 22nd! Hear hear! I see you put the “left” in quotes. That’s good because I’ve found most of the “left” strongly support UKIP because of support for British workers and British jobs. Pete, I have no problem with genuine left or socialist minded people……its not my religion, but I admire folk with a genuine ideology who can debate their doctrine whilst at least listening to the opposite point of view. But what we have today is an assault against democracy which is being ‘legitimized’ by the Political Class in Westminster. UKIP are being hunted down like wild animals……..yet they were climate sceptics before it was fashionable (now it’s almost acceptance to offer the contrary view), they talked about uncontrolled immigration when it was unacceptable to do do so; they said we should quit the EU & have now forced a referendum, as promised by the Tories.,…….I could go on but it is late……………. I’m voting UKIP because I admire their tenacity & straigh talking………..
Q:Why does UKIP’s position on climate change not feature in their campaign material when the eastleigh lib dems are so zealous ‘tackling climate change’. the issue – ,whether to leave the EU – is peripheral to the political dialectic of our age. Mmmm. I think Nigel Farage has been shooting himself in the foot (or mouth!) a bit lately, saying things along the lines of “we want our country back”. Much better to have said “we want CONTROL OF our country back”. So he may have alientated previous UKIP voters, including Eastleigh area ones, rather than gaining more voters. The latter statement also sounds much less contentious if looking at the racism criticism, though I saw no evidence of racism in anything Diane James said when contesting the MP seat. It would also seem more sensible to have Diane James as the 2015 candidate for the Eastleigh area (NB the whole of the Eastleigh voting area, not just the town! ), as she would likely increase the number of votes she polled last time, where many people would have voted for her as an individual much more experienced, knowledgeable and charismatic than the other Eastleigh candidates, and not because she’s a member of UKIP. Nigel Farage as candidate might just reduce the number of UKIP voters, apart from amongst stalwart UKIP supporters. Perhaps he is a liability anywhere then? An unelectable leader? Is that possible? Let’s ask that question next year when Nigel becomes an MP. A few days, before the Local Elections!!!!! You mean he won’t be somewhere on BBC TV that evening? The BBC will be there! I guarantee it! free entry into the UK of 45million Ukrainians? I can’t see 45 million Ukrainians coming here any time soon, the country is being split in half. Steve-you suggested “Ukrainians” will be coming here. No Sam, you suggested it – I’m saying it won’t happen. Surprised we haven’t had a summary of the meeting on here. Is there a reason? There was a good write up of the Portsmouth meeting so I was looking forward to reading notes of the local meeting.